especially the members of the high table, distinguished ladies and gentlemen here gathered and those listening around the world. I say “ndewo nu umu Chineke” to all of you. It is my guess that the question on the lips of every delegate here today is perhaps ‘what is Nnamdi Kanu doing here at the congress of all Igbos worldwide talking about the global effort to restore Biafra’?. My answer as always is a very simple one, ‘izu ka nma na nne ji’. 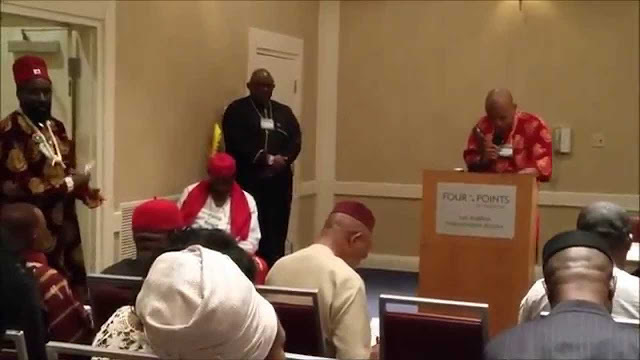 There will be no Biafra without the support of World Igbo Congress in particular and the Igbos in the USA in general. (2) “Eziokwu bu ndu” which is the weaving of the irreducibility of truth into the day to day discourse of life, in essence a life of nobility predicated on honesty. Futhermore and ingrained in the DNA of every Biafran, is the axiomatic expression that “Chi bu Eze” or God is King. Regrettably, the British colonial masters forcefully merged BIAFRA with the other two nations of AREWA and ODUDUWA to form what is known today as Nigeria. Implicit in our value system and its incompatibility with those from other merged nations lies the need for the immediate extrication and restoration of the nation of Biafra from the country called Nigeria to represent as it was ordained a pinnacle of hope for the black race the world over. That Nigeria is perpetually in the doldrums politically, economically, and socially is of no surprise to any discerning mind and keen followers of the miserable history of Nigeria. After all, is it not why today we found ourselves in far flung lands like the USA and many more countries around the world? The frustrating part of this history is the fact that Biafrans have been at the receiving end of the sorry state of affairs in Nigeria even though they possess the manpower and resources to sustain themselves and flourish as an independent nation. Biafrans are known for their industrious and enterprising lifestyle propelled by sheer hard work and the “can do” spirit. Biafrans don’t run away from history, rather they make history. Biafrans are adventurous and are not afraid to venture into the unknown. But the same cannot be said of other merged nations in the country called Nigeria. Biafrans have been held down and their development arrested by virtue of merging them with other nations to form Nigeria. One of the questions going through the minds of many could be; but who are actually the Biafrans or put in another way; what is the footprint of Biafraland? Biafraland consists of the states in the present South East and South-South with the exception of Edo state but including Igbanke in Edo state. Biafraland also include Igala in Kogi state and Idoma land in Benue state. In all these areas we have the traditional four-market days and their women tie two-piece wrappers and have names and words that are interchangeable irrespective of the state. For over 100 years Biafrans have endured the unholy marriage called amalgamation and creation of Nigeria by the British colonial masters. Biafrans at home and in the diaspora can no longer endure the subjugation of Biafra under Nigeria. As in most revolutions and emancipation struggles, patriotic citizens in diaspora are always in the lead for collective objective of achieving nationhood. A very good example is the case of the State of Israel in which the Jews in America funded and supported the independence of the nation of Israel. We share a common ancestry with our Jewish brothers and should follow similar strategy in achieving the nation of Biafra. In this regard, WIC is expected to play a critical role in the quest for the restoration of the nation of BIAFRA. As some of you may have known, there is an ongoing effort to galvanize Biafrans globally to work together to achieve the collective objective of restoration of the nation of Biafra. This effort is spearheaded by the Indigenous People of Biafra (IPOB) with Radio Biafra London (RBL) as the media arm. The operational headquarters of IPOB is in Vitoria-Spain, outside of Nigeria for obvious reasons. IPOB is registered and recognized by various countries all over the world. Coincidentally, the USA headquarters of IPOB is here in Los Angeles—California. But what has IPOB/RBL achieved, you may ask? - Radio Biafra is today the only African institution in the history of the world to be ranked No.1 in an independent survey against other (media) organizations from around the world. That Radio Biafra is today more popular than BBC Radio is clear testimony to what we can accomplish as a race when we put our minds to it. - Designation of Boko Haram as F.T.O. (Foreign Terrorist Organization) by the Department of States of the USA. We have the proof to make this claim. - IPOB gained recognition as national liberation movement in over 88 countries where we are registered and carry out our meetings and rallies unhindered. - Initiated and continued annual 30th of May Biafra Heroes Remembrance Day. The 2015 edition at Aba recorded over 3 million attendees without a single adverse incident recorded. - Forced the Nigerian Government to halt the continuous aerial bombardment of Cross Rivers and Akwa Ibom under the guise of fighting kidnappers’ havens. We alerted the world that Nigeria used the banned NAPALM bombs on Biafrans for three consecutive days of June 17th—19th. - We have raised the consciousness of our people on the Rights and the legality of their quest for their nation of Biafra based on the UNDRIP which Nigeria is a signatory to. - Debunked and dismantled all the lies and innuendoes dished out by Yoruba and Northern media concerning Biafrans, which in some cases are geared towards dividing the various sections/areas of Biafraland. - We have formed an effective opposition to the tyrannical rule of the current president of Nigeria and checkmated him in trying to take Biafrans for a ride. - Nigerian Police now know that you can no longer kill a Biafran and get away with it. Through the activities of IPOB in Igweocha (Port Harcourt) the officer responsible for the shooting of an unarmed bus driver has been dismissed from the Nigerian Police pending trial. You will agree with me that this has never happened before. - Through our work/efforts, we got Microsoft to recognize the word Biafra. - We have brought Biafra restoration into global discourse such that media juggernauts such as CNN, BBC, VOA, RFI, etc., who hitherto stayed away from discussing Biafra are now forced to talk about Biafra. - We are also registered with the ECOSOC department of United Nations as INDIGENOUS PEOPLE OF BIAFRA, where we made it clear that no organization is representing us but we are Biafrans and representing ourselves. BIAFRA restoration is here, all you have to do is put in your efforts and BIAFRA will come. Like many other well-meaning Biafrans of Igbo extraction around the world, I look forward to the day when World Igbo Congress will be held in any of our towns and villages in Biafraland. Leader of the Indigenous People of Biafra (IPOB).